Apure essential oil blend of Lemongrass and Patchouli Dhanvantari is the god of health, healing and cure. He is the physician of the gods and the god of Ayurvedic medicine. We pray to Lord Dhanvantari seeking his blessings for health. 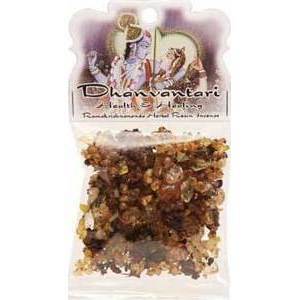 Dhanvantari emerged from the Ocean of Milk' and by his mere play, he destroys all disease like a mighty forest Prabhuji's Giftsresin incense are unique blends of herbs, resins, oils and aromatic woods mixed together and infused with prayers and special mantras. These resin incense are an exotic blends of frankincense, myrrh, copal, amber, pine, lavender, rosemary, orange peel, cinnamon, clove, sandalwood, clay and brown sugar mixed together with a variety of oils and secret mantras creating the perfect pure herbal resin Our authentic aromas are so powerful that half a tea spoon on a small charcoal will fill up your entire home or business with a mood transforming scent. For a complete purification ceremony use after smudging with "White" or "Dessert" Sage." Made in U.S.A.